Do you need powerful low-end bass instruments for your tracks? 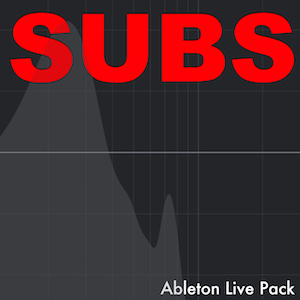 SUBS is a collection of Ableton Live Instrument Racks for earth-shaking bass sounds. I decided I was growing tired of always recreating my sub bass instruments, so I built SUBS. SUBS contains samples of 30 sub oscillators from analog and digital synthesizers. I recorded many different waveforms that you can easily select between using the SUB Selector Macro Control. Once you have your Sub selected, you can customize its tone using the FM OSC controls. Then tame it with the LowPass Filter, perhaps add some Glide between notes. Finally you can modulate the FM OSC using the LFO controls. Sounds range from pure clean digital sine waves to harsh and aggressive moving basses. Included with SUBS are two bass Audio Effect Racks. ADM MONO Subs - FX Highs allows you to keep your low sub frequencies in mono, while applying Saturation, Chorus, and Delays to the higher frequencies. This can be a powerful tool in keeping your low frequencies tame within a mix while adding some interest to the upper frequencies. The ADM Speaker Breaker FX emulates the sound of bass destroying speakers. It's a collection of different distortions that all interact with each other via the Macro Controls. The effect can be like a subtle rattling of a speaker cone to all out destruction. And no, it won't blow your speakers! Put on some quality headphones or set up some monitors capable of producing extremely low sub bass frequencies, and watch the walkthrough video below to see SUBS in action.